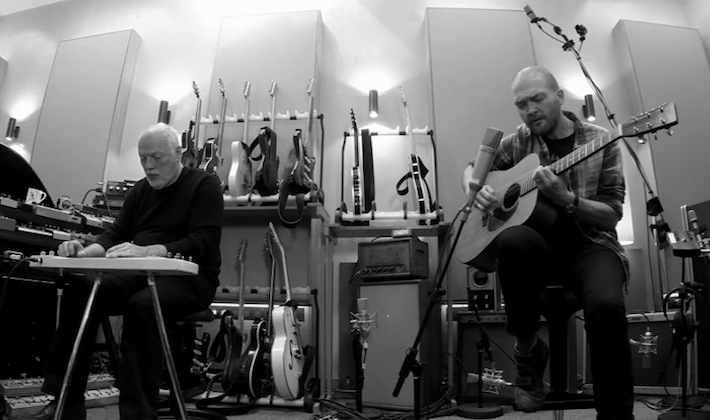 Ben Watt with David Gilmour! Ben Watt, perhaps best known from 90s trip-hop duo Everything But The Girl, will release his new solo album, Hendra, on April 29 and joining him on the track The Levels, are none other than David Gilmour! Watt recently released a clip, featuring David, performing a stripped down version of the song. The clip is filmed in David’s new recording studio located in Hove, just outside Brighton. The room is packed with some familiar amps and guitars and some new and interesting stuff as well. David’s playing the blonde Fender Deluxe lap steel into (it seems) the Alessandro Bluetick amp, using just a clean tone with delay. He’s also using a volume pedal (Ernie Ball?) for controlling the volume and creating swells. To David’s left sits what looks like two shelfs loaded with different pedals, including two Tube Drivers, Boss CS-2 (? ), several Effectrode pedals including the Fire Bottle, PC-2A compressor and Tube Vibe and there’s also a new Peterson Stomp Classic Strobotuner. Next to the pedals, in the back, is a familiar looking Binson Echorec II! Underneath all the pedals are what looks like several Loop-Master switches. The guitar stand behind Gilmour feature a range of different guitars – top from left: Gibson ES with P90s (? ), 1956 Gibson Les Paul Gold Top with Bigsby tremolo, a blonde Fender Telecaster (1950s Custom Shop replica? ), unknown black guitar and a customized Black Strat NOS body featuring a fretless neck. Bottom from left: The Black Strat, the Red Strat, Gretsch Duo Jet (?) and a Gretsch Falcon. A third guitar stand feature the Gibson EH-150 lap steel and a (black?) Fender Custom Telecaster with a maple neck. Behind Watt are several amps. Left to right: Alessandro Bluetick with cabinet, Magnatone 280-A 50w combo, with a Conn Strobo tuner on top, Fender tweed Twin combo, Yamaha RA-200 rotating speaker, with the Alembic F-2B on top, Hiwatt SA212 50w combo, with a Fender Champ on top. The amps are mic’ed with (it seems) both Shure KSM 32 and Neuman u87s. David’s playing reminds me very much of Fat old Sun and his slide tones from the early days, which fits this song, or at least this performance, very well. Perhaps a glimpse into what we’ll be hearing on David’s own solo album, when that may appear sometime in the future. The rig and choice of guitars and pedals sure look like he’s rediscovering some of his earlier tones. ps- the link over for the first photo of DG and BW appears to be broken. Thank you for the site! It was interesting timing as the local used music equipment shop just received 4 of the 260’s! This may be the Alessandro Redbone Special that David was using to power his leslie studio cab in his studio and is using on the RTL tour with his Hiwatt Custom 50’s. It looks a lot like the Alessandro next to the flamed maple one in his current live rig, which are both Redbone Specials. Also, he’s got the Alessandro Muzzle attenuator sitting atop the amp here, which would make even more sense being that the Redbone Special is 55 watts. However, this is a quiet session so the Bluetick is also a possibility but he is definitely using Alessandro’s attenuator. Just some information I thought I would pass on! Meddle side “B” had some great music IMO. Wouldn’t it be different if they follow that side to stardom, lol. Or not! I play in a project in the South of England hoping to become a Pink Floyd tribute band. We are working hard and starting to refine our performance. My colleague and fellow musician John worked as Bens guitar tech for a gig at Islington Assembly Rooms at the end of May and had the pleasure of Mr Gilmours company for rehearsals and a special appearance at the gig. Mr Taylor was also there so a lot of things were discussed and signed! I wl get my friend (a technofobe) to post his recollections of the gig to you!! News from the end of last year: Graham Nash on a tv interview has confirmed that is making some performances on a new album of David Gilmour! Let’s just wait! Cheers. Thanks for the Write up Bjorn. I hope to hear Gilmour’s new work out sometime soon! Of course Ben Watt started all the way back in 1982 where an early song appears on Cherry Red LP called Pillows and Prayers, geeez is that how long ago it was? Thanks Martin, You are right! Theses K&M 17515 looks fantastic! Anyway thanks Bjorn for the search! Best of all: great to see DG on action again!! I prefer the album version. Some great tones. WOW! Like something from Meddle. Very retro sound! What would you give to have been able to be in that room with unlimited access to all that gear? I’m pretty sure these racks are K&M 17515 (for five guitars) and 17513 (for three guitars). I have a 17515. It is translucent so that it doesn’t colour guitars with nitro finishes. It is indeed very solid and I can strongly recommend it. No reason to think you would take offense at all. Just a phrase I use, think Rodney Dangerfield in Caddyshack. Looking back at the post I don’t see why I put it in there. I’ve listened to this song a half dozen times and I’ll be buying the CD. Thanks for posting! Like you I instantly thought; Fat Old Sun, very reminiscent. Interesting look at DG’s new studio too, I wonder why he isn’t using the Astoria? This sounds beautiful! This song makes me think of Pillow Of Winds a bit does it you? Is it weird I played 5 times in a row? lol Thanks for sharing this Bjorn! Im interested to hear if he will use the tube vibe on his new album. Take care! Thats exactly what I thought, it was a little emotional to hear that 68 kind of sound. Can’t wait to see what happens. No offense Bjorn, but between you and me that’s the best new song I’ve heard in many years. It’s the perfect example of why Dave is the finest slide player alive. Beautiful song! Every time I see some new bit of material released by David, whether it’s a guest appearance or anything else, I always freak out a little bit ;) I cannot wait to hear more about a potential new album this year! I wouldn’t mind a throwback to some of his earlier tones at all!